"We wanted a rapid solution, and Iron Speed Designer provided that for us." The ADP Secure File Transfer application provides a secure method of transferring CAD drawings, designs and communications between ADP, a motor design company, and their clients. ADP transfer drawings and other digital assets from their office to their website via an HTTPS secure connection. The files are further encrypted and stored on the server. Clients login to the website and download the files to their office via the secure connection. Clients only see their own files, and no mention of any other client is revealed to maintain privacy. The files are decrypted on the fly during the transfer and email notifications sent out upon successful completion to notify the other party. 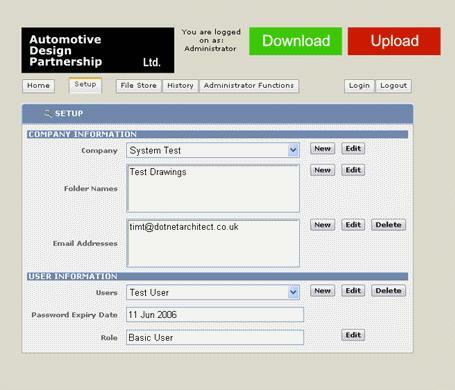 Similarly, clients can upload files to ADP where they can be downloaded by ADP to their office. The ADP Secure File Transfer application also handles various housekeeping tasks such as password expiry and old file deletion. An administrative portion of the application lets ADP set up and control various client accounts and logins, assign roles, monitor file transfers and other tasks. To keep the design simple, clients only see two buttons, Upload and Download, minimizing the interface options to wade through. ADP administrative users have a more sophisticated interface to set up clients, users, and monitor transfers. Role-based security was used to control access to the website. There is one Microsoft SQL Server database used comprising 14 tables. The History table, which logs all transfers, currently runs at 200 rows and will grow over time. There are a total of 55 web pages. The project took two weeks to implement, with one person, a senior developer with 27 years experience, doing the database design, web design and implementation. The project was started using Iron Speed Designer V2.0 but was restarted when V3.0 came along because this made customizing the code easier. The code customizations took about week to perfect, this being my first Iron Speed Designer project. A new file upload control was used that provides progress feedback due to the large file sizes (some over 100mb). The Microsoft tree view control was also used to provide a list of files uploaded. Approximately 1,000 lines of code were added, mainly in the administration module to encrypt, decrypt and create various audit entries. No layout customizations were required for this project. We wanted a rapid solution, and Iron Speed Designer provided that for us. Without Iron Speed Designer, we would have taken several additional weeks just writing the plumbing code. Iron Speed Designer saved us this effort. I intend to refine the design and launch it as a general secure file transfer website for companies and individuals. Tim Titchmarsh runs his own software design and consultancy company and has been actively involved in software since when 8-inch floppy disks were considered to be the final word in data storage. "I cut my teeth on Assembler then moved across to C for many years before moving into Visual Basic and SQL Server designing 3-tier client server apps for blue chip clients. I then got involved early on with .NET and C# in a big way and have successfully designed many database-driven web applications in finance and insurance for small and large companies based in the UK and Switzerland." Tim is a member of the Microsoft MSDN Visual Studio Team Developer and The Microsoft Partner Program.